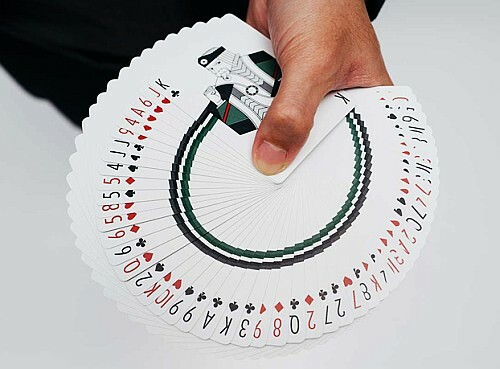 Cardistry is an art-form with playing cards that has become increasing popular over the past few years. 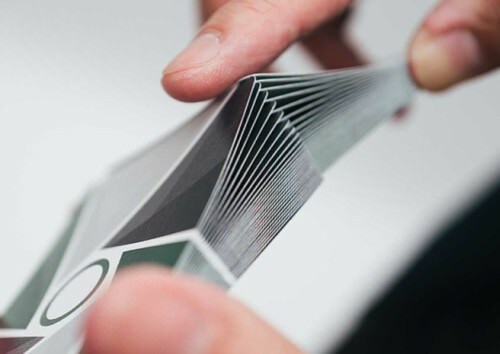 Originating from magic, where magicians like to use fancy moves with the cards to impress the audience, cardistry has now exploded and become its own hobby, distinct from card magic. Cardistry basically involves fancy ways of shuffling and manipulating a deck of cards to create visually amazing cuts and moves. But there is nothing basic to doing it. This art of card flourishing requires a unique skill and dexterity developed through hours of practice - and a lot of dropped cards! But its uniqueness and creative qualities have allowed it to become super popular over recent years. 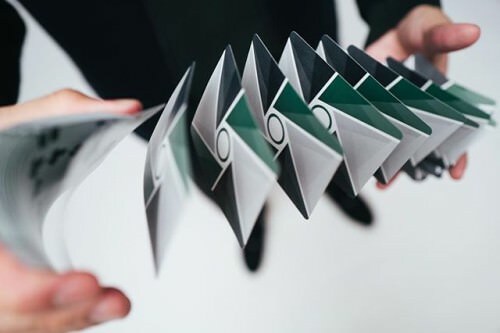 The Virts team have now released five decks in total, all designed specifically for cardistry, with a recognizable signature design that has similar features across each deck. Recently at the end of last year, they released their newest deck, and quite possibly their best, namely the new Fall/Winter 2017 Virtuoso deck, codenamed the FW17 Virtuoso. Excitement for the release of this deck was so huge, that when they released it, the massive number of people going to their website to purchase the cards actually caused the site to crash, causing the release to be delayed! The FW17 Virtuoso deck is one of the best decks for cardistry that you will find on the market, and it's the subject of this review. 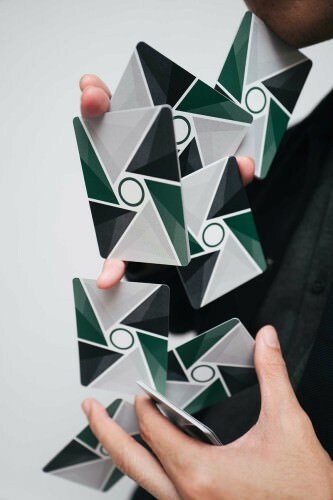 The colour scheme for the entire FW17 Virtuoso deck is a green, black and grey, with the different sections that are divided into varying shades of these colours, creating a cool geometric effect. The tuck case showcases this by means of a minimalistic box that relies exclusively on those three colours. 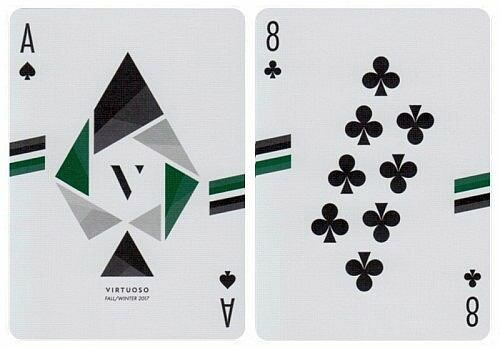 The Virts logo (a classy letter V) is on the front and side of the tuck, with "Virtuoso" on the other side. On the inside of the flap is the logo and also the words “designed for cardistry”, which reminds us of the primary target audience that this deck has been created for. When you combine three of these decks next to each other, it allows the clever wraparound design to be seen enjoyed, which creates a cool display for the decks. Inside this tuck case, you will get your hands on arguably the best deck for cardistry on the market. The signature back design is recognizable to all cardists, featuring the Virts signature design style of six `blades' of triangles dividing the card's canvas into segments, separated with white lines, which come together in the center of the card to form a hexagon. 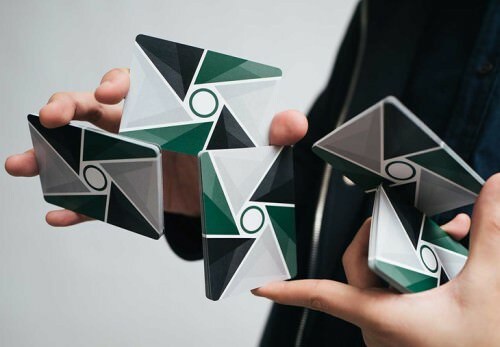 What’s new about this deck for the Virts is the fact that each triangle, rather than being composed fully of one colour, is split into geometric shapes of varying shades of the colour. This is a novel effect which adds more to fans and spreads, and makes the back design a bit less simplistic than earlier designs. In the very centre of the card is a circle of green in the white hexagon. This allows for spins and twirls to have a central focal point, which looks very eye-catching when the cards are in circular motion. On cameras, it even creates an optical illusion called the “wagon wheel effect”. The circle in the centre also also creates a clear focus point on the cards, allowing a point of motion and central point of the card to be easily seen and visualized in cuts. The borderless design is made especially so that cardists are able to create beautiful designs when they fan and spread the cards, which is enhanced by the different shades of the colours. This allows the cards to meld together in different moves and enhance the visual appeal. Fanning the cards one way or the other will also result in different colours showing up, which is really fun to play around with. The faces of these cards are equally impressive for cardistry. With customized faces laid out in unique ways, these recognizable faces are still unique and interesting for card flourishing. Each pip is thoroughly customized, and is set out in geometric ways that have been designed specifically for cardistry. A traditional approach has been taken to the pip colours, with the use of red and black, unlike the previous deck. The deep red of the Heart and Diamond pips stands out from the green, and in my view looks terrific. 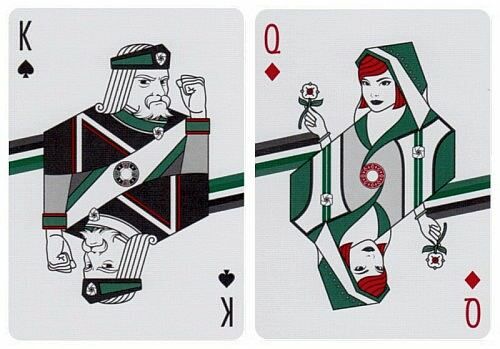 One of the highlights of the faces is the fact that the back-design wraps back around to the front of the cards, and creates stripes of green and grey which accentuate face fans and spreads. The unique and amazingly designed court cards are a take on the classic French designs. As an inside joke, the hands of the characters have been drawn based on photographs of the actual hands of the Virts team members. Now that's a pretty neat piece of trivia to know! These cards are printed in USA, and feature a crushed paper stock. 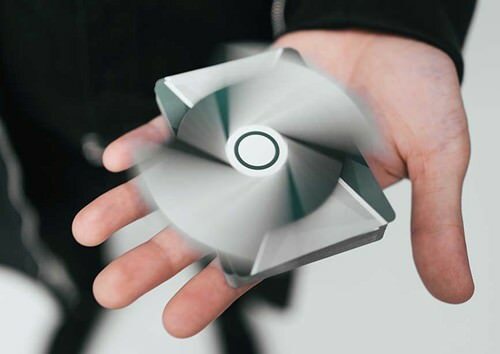 This means that they are nice and soft, handle great straight out of the box, which is just what a cardist wants. Spreading, fanning, springing, and all other uses for the cards just work wonderfully. The cut of the deck also allows for beautiful and easy faro shuffles, which have a great visual appeal, especially when combined with a cascade move following. 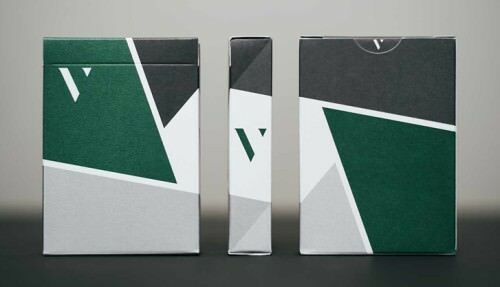 The Virts decks are also renowned for being durable, and these cards fit the bill, and with proper care should last a decent time - although as any fan of cardistry knows well, no deck is immortal. The cards are made of paper from sustainable forests, printed with environmentally friendly ink. In fact, The Virts claim that they are so environmentally friendly that you can even eat them! And before you ask, yes, we did try eating one! While they are technically edible, we found that they don’t have much taste other than the expected cardboard flavours. So unless you urgently need more fibre in your diet, I'd recommend them more for cardistry than food! The deck also comes with four cards that provide information about the deck. The backs of these four cards each depict one quarter of the deck's main back design, so when you put them all together they make a great piece to stick up on your wall and display your love for this deck. In fact, if you checked my bedroom wall, that's exactly the art piece you'd find right now above my bed! 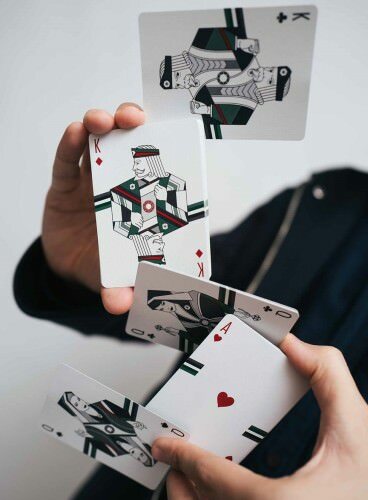 Once again The Virts have come through with another wonderful deck, after much anticipation and build-up ahead of the release of their newest playing cards. The FW17 Virtuoso deck is an amazing deck all round, and especially looks stunning when used for card flourishing, with stellar quality. 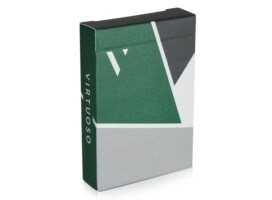 When ordering directly from The Virts, you can also get access to purchasing some of their cardistry video tutorials as add-ons. These tutorials aren't available anywhere else or in any other way, and I especially recommend the Cascade & Perfect Faro tutorial (video trailer), which is brilliant. The Flicker Shot tutorial (video trailer) is also terrific. Definitely consider picking some of these up if you do decide to grab some of these decks. 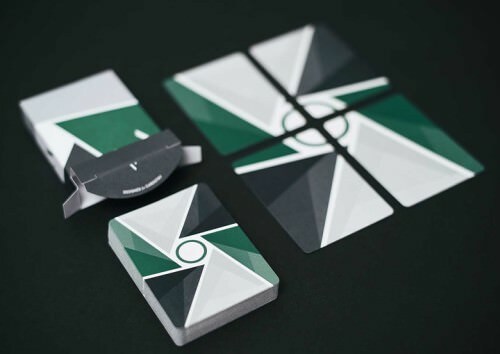 If you have any interest in cardistry whatsoever, you're certain to be happy with these playing cards. 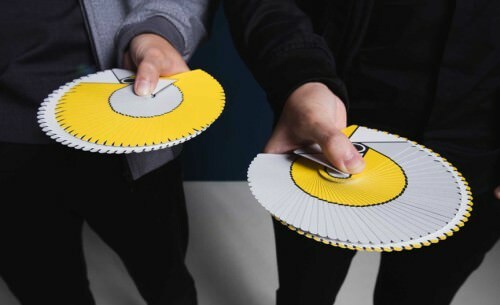 They are widely hailed by cardists across the world for the wonderful asset they prove to be for any card flourishing maneuvers, and even a simple shuffle, fan, or spread, reaches new heights with this deck in your hands. 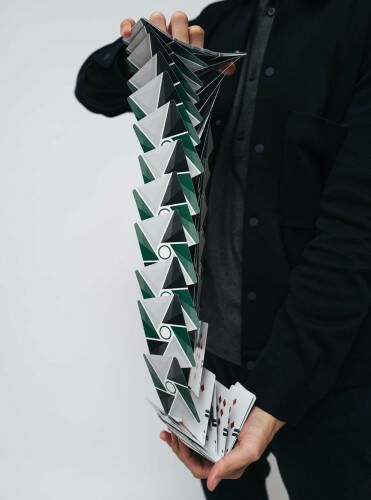 So pick up a deck or two or more, and take a deck of playing cards to the next level by giving cardistry a go! What to learn more? 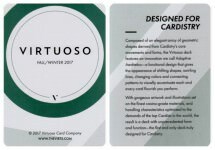 Check out The Virts for more information about the FW17 Virtuoso deck.